I would like to mention some facts about andhra-food! Staple Food ,obviously is rice. 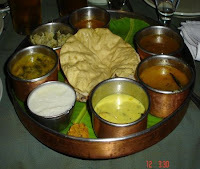 Food of AP(Andhra Pradesh) is known for its heavy use of spices and chillies. And Curd is part of the meal while it helps to neutralise the spicy nature of the food. Snack or tiffin type are made of many preparations like onion pakodas, vadas, or savories,idly with spicy sambhar, upmas,and savouries which include murukkus,appadams,viz..
Andhra is famous for its Hyderabad Cuisine. It has the influence of Mughalai Food. The taste ranges from sour, sweet, salt and spicy. One of the finest foods are Baingan Bhartha and Hyderabadi Biryani.